This dissertation examines what network in the human brain is involved in the perception of prosody and whether activity within this network is modulated by the personality trait alexithymia. The first four empirical chapters of the dissertation explore what network in the brain is involved in the perception of emotional and linguistic prosody. 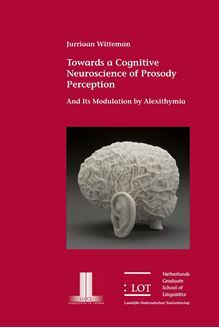 Fur-thermore, chapters four and five investigate whether perception of emotional prosody might be automatic and whether automaticity of perception can also be demonstrated for emotional music. The last two empirical chapters exam-ine whether individual variation in the personality trait alexithymia modu-lates activity within the emotional prosody perception network. The first four chapters of this dissertation reveal that a bihemispheric network consisting of Heschl’s gyrus, the middle superior temporal gyrus, the posterior superior temporal gyrus and the pars opercularis of the inferior frontal gyrus is involved in the perception of emotional prosody. Furthermore, relative right hemispheric specialization for emotional prosody perception can be demon-strated but no hemispheric specialization can be found for linguistic prosody perception. Moreover, hemispheric specialization for emotional prosody per-ception seems to be driven by hemispheric specialization for non-prosody-spe-cific acoustic dimensions of the speech signal, and not for abstract emotional processing. Additionally, automaticity of processing can be demonstrated for emotional prosody, particularly for anger, but not for emotional music. Last, alexithymia can indeed be demonstrated to modulate activity within the emo-tional prosody perception network, particularly at relatively early components of the emotional prosody perception pathway. This dissertation is of interest to neurolinguists, (neuro-)phoneticians, psy-chologists, cognitive neuroscientists, comparative biologists and neurologists specialized in aphasia.